Hiraizumi, Tono, and Hanamaki are all located in the inland region of Iwate. In the eleventh and twelfth century, Hiraizumi was the second-largest city in Japan after Kyoto, and in 2011 became the first site in Tohoku to be added to the World Heritage List. Tono, with classic Japanese scenery of rice fields, is known thanks to the book Tono Monogatari, which includes local legends of kappa and zashiki-warashi. 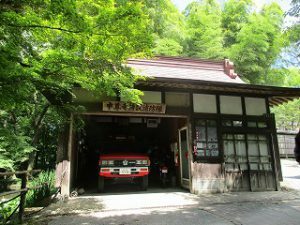 Hanamaki has many hot springs, and is the birthplace of Kenji Miyazawa, a children’s author and poet who is still popular to this day. Local history and culture is still very present in all three towns, and they are popular with tourists both from within Japan and abroad. 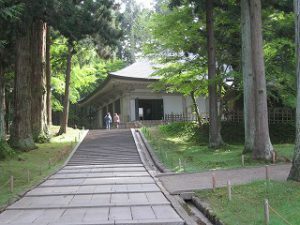 In Hiraizumi, the tour will cover initiatives at Chuson-ji temple to preserve cultural artifacts and reveal the secrets of the past through ongoing excavations of archaeological sites, and meet with women who revived a traditional form of kagura (Shinto ritual dance) that had died out due to a lack of performers, and have even performed overseas. 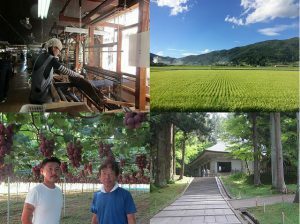 In Tono, with its beautiful landscapes and its history and culture represented in Tono Monogatari, the tour will cover green tourism initiatives taking advantage of these local resources to invigorate the town, and experience an overnight stay in a farming village home. There is also a local tradition of carefully-made artisan products running contrary to the trend of mass production, and these products have become popular in Tokyo and overseas. 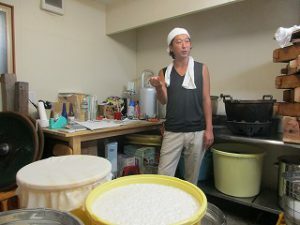 The tour will cover a young sake brewer whose doburoku (unfiltered sake) made from organic rice has been well-received overseas, a textile maker with only 17 employees which produces high-quality tweed used by global fashion brands, and a grape farmer whose raisins made from high-quality, large grapes dried on the vine have gained popularity with consumers. One of the sites in the World Heritage listing, Chuson-ji is a temple built by the Oshu-Fujiwara clan. Konjikido, a National Treasure, is the main building, built in 1124, and it is held up along with Byodoin Temple’s Ho’odo as exemplifying Pure Land architecture in the Heian period. Various efforts were made with the design to represent the paradise of the Pure Land, with both the inside and outside of Konjikido gilded in gold foil, which has preserved the splendor of ancient Hiraizumi culture to the present day. Constant efforts have been made at Chuson-ji to preserve cultural artifacts including Konjikido for future generations. Starting in 1962, the “Great Showa Repair” was carried out over seven years, to restore Konjikido to its original state. The damaged building was dismantled, repaired by experts and master craftsmen, and restored with 30,000 sheets of gold foil. 2018 marks the 50th anniversary of the completion of the Great Showa Repair. With deterioration such as gaps between wooden planks occurring over the years, experts examine the building to determine the best methods for preservation and whether repairs are necessary. Most of the other buildings in Hiraizumi aside from the Chuson-ji Konjikido were lost by the Edo period, with archaeological excavations of the sites being the only way to determine what they originally looked like. 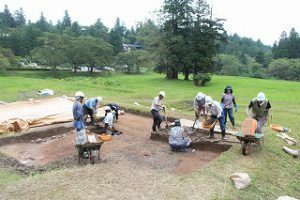 It has been determined that the remains of the twelfth century temple are preserved in good condition under the grounds of Chuson-ji Temple, and archaeological excavations are underway to reveal what Hiraizumi looked like in the past. 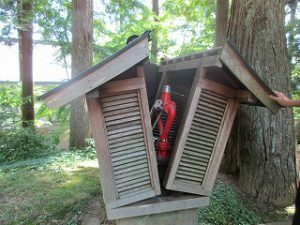 The tour will hear about the Great Showa Repair fifty years ago, and the current state of Konjikido. Around Konjikido, the tour will also see fire-fighting devices such as water cannons and drenchers which have been camouflaged to preserve the scenery of Konjikido and the other cultural artifacts while also protecting them from fire. Finally, the tour will also observe the excavation currently being carried out at the large pond site in the Chuson-ji grounds. *No photographs or video allowed inside Konjikido. Kagura is a form of song and dance offered up to the gods during Shinto rituals, with different styles throughout Japan. One of these styles, Takkoku no Iwaya Bishamon kagura, originated from kagura that shugenja, ascetic monks, performed at Takkoku no Iwaya Bishamondo Temple, said to have been built in the ninth century. The tradition died out with the ban on shugen at the beginning of the Meiji period, but men of the village passed it on by removing the shugen aspects and focusing on the kagura’s storytelling. 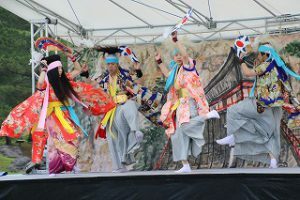 During the societal changes after World War II, it became difficult to find performers, and the local kagura group was forced to shut down for the second time. However, in 1986, an initiative was started to teach the basics of kagura at local preschools to pass on the tradition to future generations. 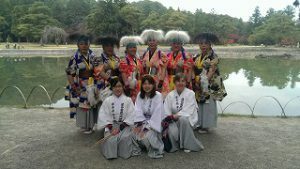 A new kagura group was formed primarily by mothers who became interested after seeing their children practicing kagura. As most kagura performers are men, this female group received a lot of attention, eventually performing not only in Japan, but also overseas in places such as London and New York’s Carnegie Hall. The group currently has ten members, with eight of them being women ranging in age from in their teens to over 60. They practice one night each week, and perform traditional dances at local events and for ceremonies at Bishamondo Temple. Ms. Rosemary Chiba, originally from England and who moved to Hiraizumi in 1991, is one of the members who joined the kagura group after seeing her child dance at preschool. Until she retired three years ago, she performed kagura as a member for over twenty years. The tour will hear about the history of Bishamon kagura and efforts to pass on traditions from Ms. Sachiko Terui, leader of the Bishamon kagura group, and her daughter Ms. Kumi Terui, before seeing a kagura performance at Takkoku no Iwaya. 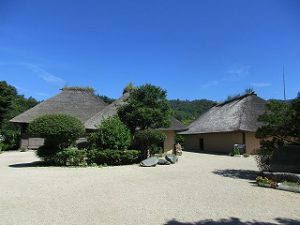 The tour will also hear from Ms. Rosemary Chiba, who is not only an expert in Hiraizumi culture and guide for foreign tourists, but was also a member of the Hiraizumi Tourism Council, about Bishamon kagura and Hiraizumi. Tono, with its beautiful, classically Japanese scenery, is one of Iwate’s most popular tourist attractions. It is known as the birthplace of folktales thanks to Tono Monogatari, and 1.56 million people visit every year seeking the kind of scenery that shows up in those stories. Tono is also both a leader in green tourism in Japan, and a successful example of it. Currently, approximately 140 households are registered for a program in which tourists can stay overnight at a farming village home and experience farm work while interacting with locals. Approximately 2,000 people a year (including students on school trips) have been experiencing rural life by picking vegetables and making meals together with residents. Tourists from Singapore, Taiwan, and the U.S. have also participated in this program. The goal of this exchange between city and rural residents is to stimulate the local economy, and to have local residents feel a sense of accomplishment and pride in their area by hosting tourists. With the noticeable success of this initiative by Tono, many delegations from other local governments have come to observe. The tour will hear from a member of the NPO Tono Natural Life Network, which runs the overnight stay program, about green tourism initiatives in Tono, and then split up into groups and experience the program themselves. The tour will also see two of Tono’s popular tourist attractions, Denshoen and Kappabuchi. 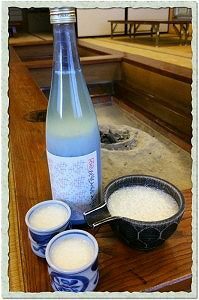 Doburoku is a simple type of sake made by fermenting rice, koji mold, and water. Many households used to make their own doburoku, but since homebrewing was banned in the Meiji period under liquor tax laws, it was only produced in secret as bootleg moonshine. However, as part of the Koizumi administration’s efforts to loosen regulations and stimulate regional economies, a “doburoku special economic zone” was established allowing for restaurants and bed and breakfasts to micro-brew their own doburoku, and in 2003 Tono became the first doburoku special economic zone in Japan. With the establishment of the doburoku special economic zone, Mr. Yotaro Sasaki, owner-chef of the auberge Tonoya You, decided to begin making doburoku, and to bring this beverage made using a unique Japanese fermenting process to the rest of the world. 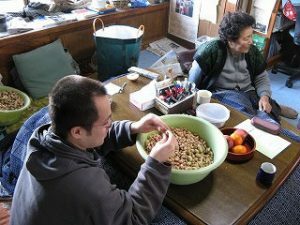 After over ten years of trial and error, he learned by himself how to ferment and age doburoku, and developed an original recipe. His doburoku, made using rice native to Tono without agricultural chemicals or fertilizers, was praised for its elegant flavor which overcame expectations for what doburoku should taste like, and is now available at fine restaurants not only within Japan, but also in France, Hong Kong, and Spain. 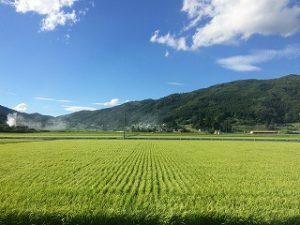 By increasing the amount of doburoku made, Mr. Sasaki would like to provide a new market to the producers of the organic rice used to make doburoku, and create a new business model. He also spoke about his hope to have the next generation of children and people who have left Tono to feel pride in their town, by having a product from a small town like Tono receiving worldwide recognition. Mr. Sasaki will speak of his efforts so far, and his thoughts on growing rice and making doburoku, as well as showing the tour group the brewery. Homespun is a type of fabric said to originally have been made by sheep farmers in Scotland using leftover wool for household use. Now, homespun refers to a type of tweed that maintains that handmade character, whether or not it is actually handwoven. It was introduced to Japan along with wool sheep when they were introduced to Iwate in the Meiji period. Nihon Home Spun, established in 1961, is currently the only company in Japan producing homespun fabric. With unique methods such as weaving silk threads in with the wool, they produce creative fabrics. The company’s quality and artistic design have led to famous overseas fashion brands from countries such as France coming to purchase their fabric, with Nihon Home Spun tweed having been used in Paris Fashion Week. Sixty to seventy percent of the company’s annual sales are to overseas customers. To respond to the increased demand, the company acquired machines for mass production, but only after seeking out a machine that could replicate the handspun, handwoven feel, and then adding their own unique modifications. 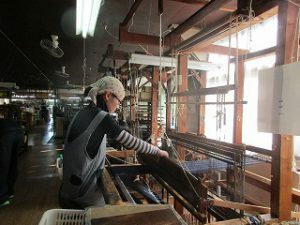 A traditional hand loom is still used for creating nearly 700 fabric samples a year, which are provided to fashion brands in Japan and around the world. The tour will hear from Senior Director Hisanori Kikuchi about the history of Nihon Home Spun, creating global products with only 17 employees, and tour the factory filled with the sound of machine looms. Sato the Authentic Vineyard grew in popularity with its high-quality raisins called Amulet of the Sun, which are made by drying an entire bunch of their large, luxury grapes on the vine. By drying the grapes, which have been grown to have a sugar content of 18% or more, at a processing facility within the vineyard immediately after harvesting them, the raisins are ready to be shipped in approximately two weeks. Far bigger and sweeter than the average raisin, with stylish packaging targeting a global audience, these raisins grew in popularity around Tokyo, and were chosen for the Omiyage Japan Selection 2015 held by the Reconstruction Agency, and also as gifts to the world leaders at the 2016 G7 Ise-Shima Summit. Mr. Hideaki Sato decided to try producing raisins to help ensure the future of the vineyard when he passes it on to the next generation. 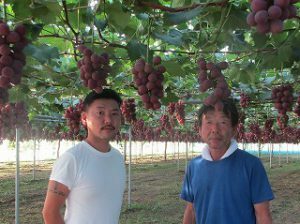 His son, Mr. Toru Sato, is also interested in starting a winery in the future. At the vineyard which will be reaching its peak for harvesting, the Satos will speak about their efforts to produce high-quality grapes and about adding value to agricultural products, as well as showing the tour group around the vineyard and raisin processing facility. 13,000 yen per person including transportation, farming village overnight stay (dinner and breakfast included), and two lunches. (1) This press tour is sponsored by Hanamaki City, Tono City, and Hiraizumi Town, and planned and operated by the FPCJ. (3) This press tour will require participants to bear part of the cost, but is not a profit-making venture. (4) Neither Hanamaki City, Tono City, Hiraizumi Town nor FPCJ will be liable for any inconvenience, trouble or accidents that might occur during the tour. (6) This press tour is intended to provide opportunities for news coverage. We request that all participants send a copy of the content of their coverage (article, video, or audio in the case of radio) to Hanamaki City, Tono City, and Hiraizumi Town through the FPCJ after their reports are published or aired. When your report is in a language other than English or Japanese, we also ask you provide a summary in English or Japanese. With receiving your application, we assume that you agree to these conditions.